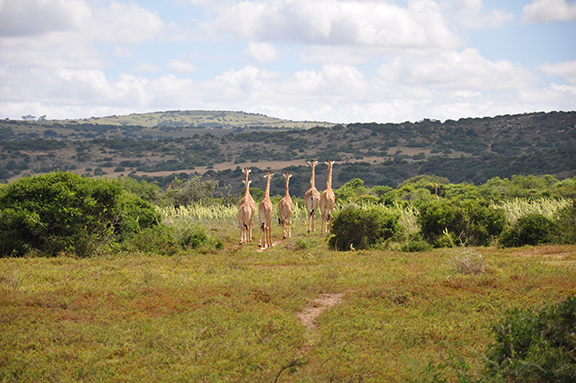 Parks & People 2012: Giraffes in the Amakhala Game Reserve, Eastern Cape Province, South Africa. Photo by Kenneth Radzieta. Guido Cervone was awarded the Faculty Fellowship Program by the National Center for Atmospheric Research for Summer 2016. Ann Myatt James (Ph.D. ’14) accepted a position as senior research analyst at the University of Maryland’s Founding Campus in Baltimore, Maryland. She will be working with the Family Welfare Research and Training Group, a research center in the School of Social Work, examining and analyzing Maryland’s welfare and child support data. Clio Andris and a colleague won a Bronze in the Kantar Information is Beautiful Awards for their visualization on the rise of partisanship. Sasha Savelyev just accepted a tenure-track position in cartography at the Texas State University in San Marcos, Texas. 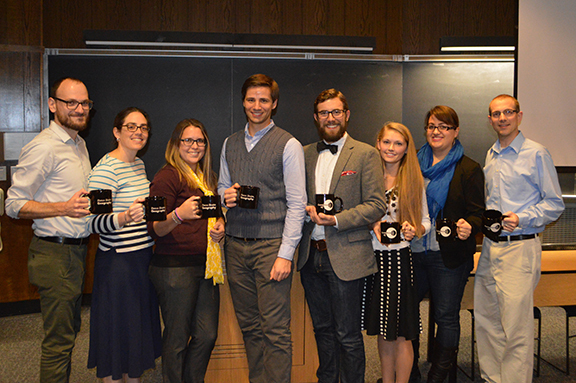 Megan Baumann and Jamie Peeler received Graduate Research Award funding from The Center for Landscape Dynamics. The Penn State women’s soccer team defeated Duke, 1-0, en route to its first-ever national championship this afternoon (Dec. 6) at WakeMed Soccer Park. The Nittany Lions tallied their eighth-straight shutout and 15th overall on the season. … Senior goalkeeper Britt Eckerstrom made her lone save of the first half on Toni Payne’s shot attempt in the 30th minute. “What makes [Cape Town, South Africa] fascinating is that this area is somewhat cornered between a mountain and the sea,” explains Assistant Professor of Geography Neil Brown, who leads Penn State’s Parks and People: South Africa program. Le Bourget, Paris—The nations of the world have been talking about climate change for 23 years. In all that time they have been adding inexorably to the carbon dioxide building up in the atmosphere and doing little to slow it. But here at the 21st United Nations climate conference, 184 countries representing more than 90 percent of global CO2 pollution are getting into detailed negotiations this week over the plans they had submitted to curb global warming. And that has provided hope for the first global landmark deal. Former graduate students Kevin Sparks (M.S. ’15) and Jinlong Yang (M.S. ’13), together with ChoroPhronesis members Alex Klippel and Jan Wallgrün had an article accepted in The Baltic International Yearbook of Cognition, Logic and Communication. Common sense, as well as fundamental theories of interpersonal communication, has often led to the prediction that long-distance romantic relationships should be unsatisfying and unstable. In this presentation, Stafford summarizes a series of investigations of long-distance dating partners that challenge this assumption. She will discuss the associations between romantic idealization, communication, and relational stability. The fourth annual College of Earth and Mineral Sciences (EMS) Undergraduate Poster Exhibition will be held from 9:30 a.m. to 2 p.m. on Dec. 2 in the Deike Building (ground floor) on Penn State’s University Park campus. Organized by the EMS Ryan Family Student Center, the poster exhibition provides an opportunity for undergraduate students in EMS to showcase their research, and connect and share their work with other students, faculty, staff and the community. The poster exhibition will include poster presentations by more than 30 EMS undergraduate students. The event is free and open to the public. Andrew Carlton is the distinguished member of Penn State’s Department of Geography with research ties to many aspects of climate science. The climatology of jet contrails is one of them. “I use satellite data to identify them their occurrences and to map them in GIS but then we also look at them on climate time scale so on periods of multiple weeks to several months so you can identify where the characteristic places in the United States that contrails tend to occur,” Carleton says in the video. For the last few years SWIG has committed to sponsoring a family through the Centre County Women’s Resource Center Holiday Sponsorship Program. Nari Senanayake (nus192@psu.edu) is collecting money through Friday, December 4. In Resilience: International Policies, Practices and Discourses. Resilience thinking is increasingly used as both a theoretical framework and as a tool for managing and governing social and social–ecological systems. However, resilience may lead to undesirable outcomes if it fails to critically engage with issues of power, justice and equity, or what we call the politics of resilience. This potential pitfall can be addressed by incorporating critical theory, which aims to critique and transform historically inequitable social realities: a goal being actively pursued by scholars who publish in, inter alia, Resilience: International Policies, Practices and Discourses.